For about a year, I ate overnight oats for breakfast every single day. I mean, why not, right? They’re easy, convenient, and nutritious. There’s literally nothing more you can ask for from a breakfast! But after eating the same thing day after day, I ended up tiring of it and moving onto other things. Breakfast cookies: also convenient! Flax banana bread: yes ma’am! Single-serve baked oatmeal: hello warm and cozy breakfast! However! Now enough time has passed that I’m totally on board the overnight oat train again. 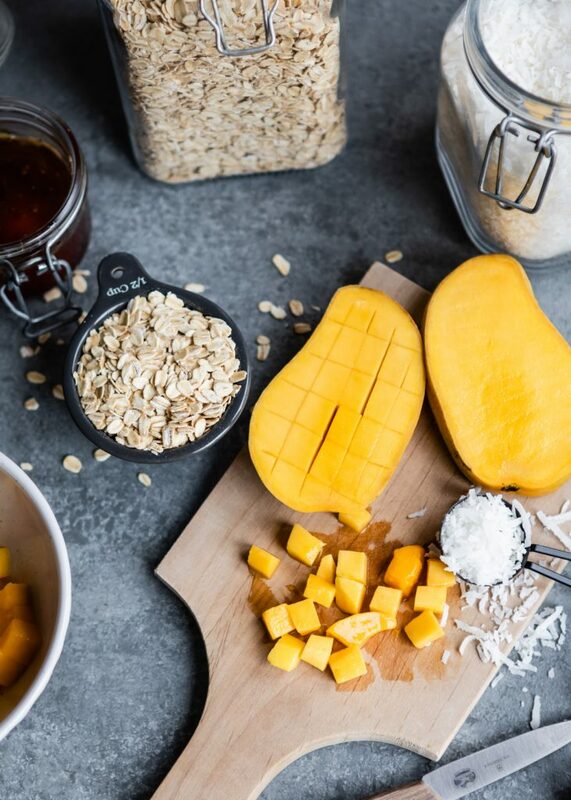 While overnight oats aren’t quite as trendy as they were a few years back, they’re not exactly a passing fad–they’ve been around in the form of muesli for over a hundred years. Muesli, or overnight oats, is basically a combination of rolled oats and milk, with any add-ins you like–usually fresh or dried fruit, nuts, and seeds. 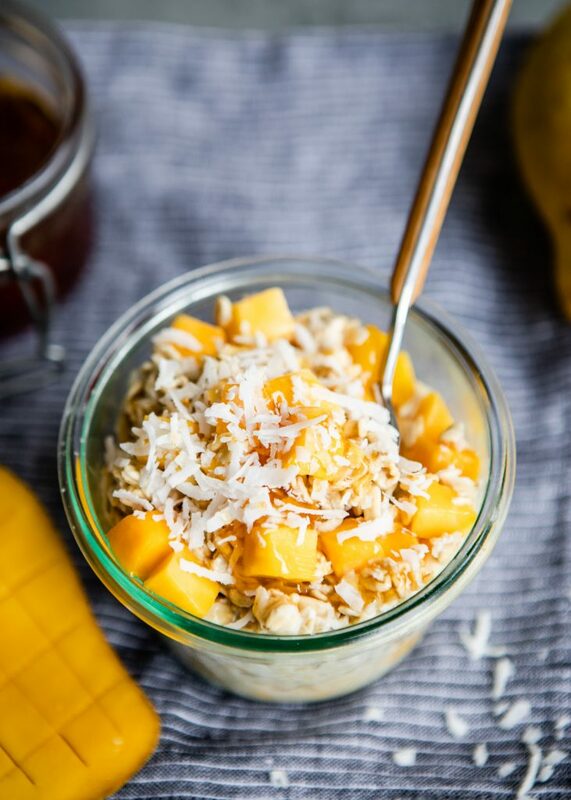 This Coco-Mango Overnight Oats recipe is my absolute favorite. 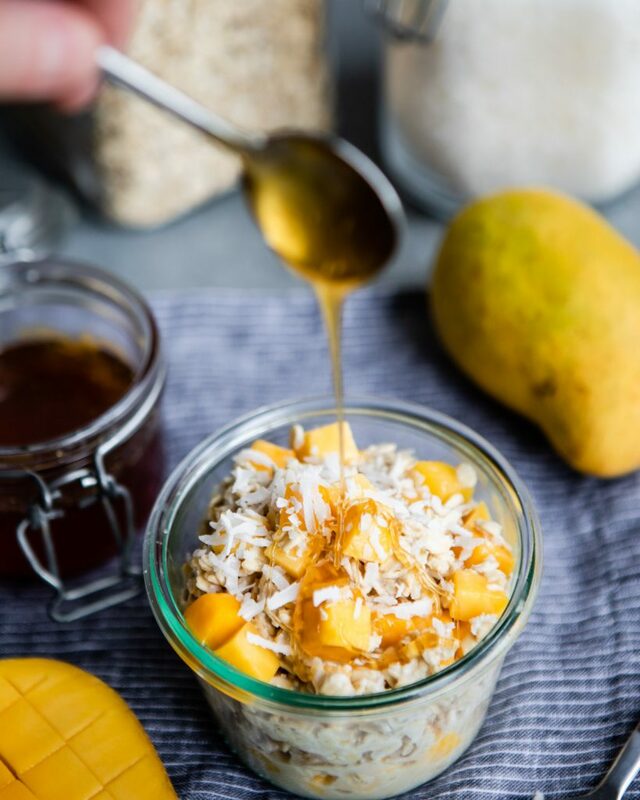 Diced mango is combined with shredded coconut and a drizzle of honey to make the perfect breakfast for summertime. If you like a little bit of crunch in your oats, almonds, macadamia nuts, and seeds are all great additions; for more protein, stir in some vanilla protein powder or a few tablespoons of hemp seeds. Also? Your kids will love it–and it’s much healthier than the sugar-loaded breakfast options marketed to them. The best part about overnight oats is that you can prepare a bunch of jars in advance and have breakfast ready to go for days. Although this recipe makes a single jar, it’s easy to double or triple the recipe to make more. 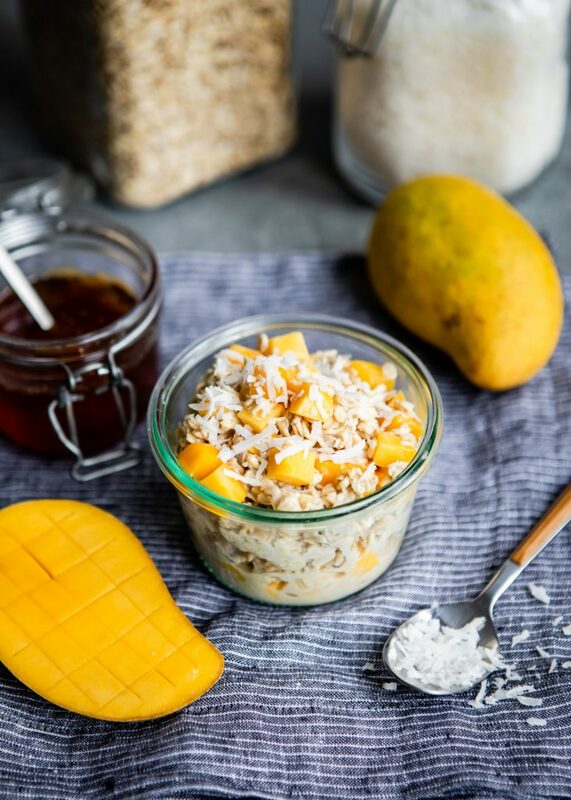 A tropical overnight oats recipe that's perfect for summertime. Combine all of the ingredients in a jar with a lid. Cover and refrigerate overnight, or up to 3 days. Stir before serving and add additional milk (for a thinner consistency), honey, and other toppings, if desired. Feel free to substitute any milk you like for the macadamia milk. For more protein, add a scoop of vanilla protein powder.